The land of the rising sun has been rising through the ranks of the footballing world over the past twenty years. This ascent has been suitably astronomical in its magnitude. I'm about to embark on an exciting journey to uncover the main driving forces behind the ability of the Samurai Blue to break onto the world stage in such a daring way. This will be the first of a 2 part series exploring the journey of Japanese football from relative continental minnows to regional powerhouse, all the way to their fantastic performances at international tournaments. First, let us begin where every story must; the beginning. The year is 1988, the month is March and Japanese football is an afterthought for the vast majority of the population; national interest in the sport is virtually non existent. Japan’s national football team has yet to qualify for an Asian Cup let alone make an appearance at the World Cup. Many Japanese people are more interested in baseball and the football culture is all but absent. Twenty years earlier, the Japanese Olympic football team had won bronze at the 1968 Olympics in Mexico. This achievement threatened to be the catalyst for football fever in the nation, but the increase in popularity was fleeting and soon turned into apathy; for twenty years the game was not progressing as had been envisioned by those that set up the Japanese Soccer League in 1965. Average attendances at JSL games in the late 70s fell to an alarmingly low 1773 per game during one season. Action had to be taken by those that loved the beautiful game; and in an office inhabited by visionary JSL officials in March 1988 was where the story really began. This was what was dubbed “The Revitalisation Committee” by the JSL, and they held their second meeting in October of that year. In November 1991, the Japan Professional Football League replaced the now defunct JSL, thus the J league was born. This defining moment was to perpetually change the shape of Japanese football. The professional league kicked off in 1993 (the same year that Japan put a bid forward to host the 2002 World Cup) and had big money investment, it attracted stellar names such as Zico and Gary Lineker, and this helped fuel interest and popularity in the newly revamped league and the sport as a whole. There was change at the grass roots level, too. Youth development was heavily on the agenda as the Japanese Football Association realised the importance of this facet. The JFA ploughed resources into youth academies, coaching and scouting. A network was set up across Japan and local schools became involved in promoting the game and coaching kids. Business also played a hand in this revolution, Nestle Japan also setting up a very successful national football training program. The effort was a concerted one and well organised, everyone was pulling in the same direction and it began to reap rewards as we will cover later. 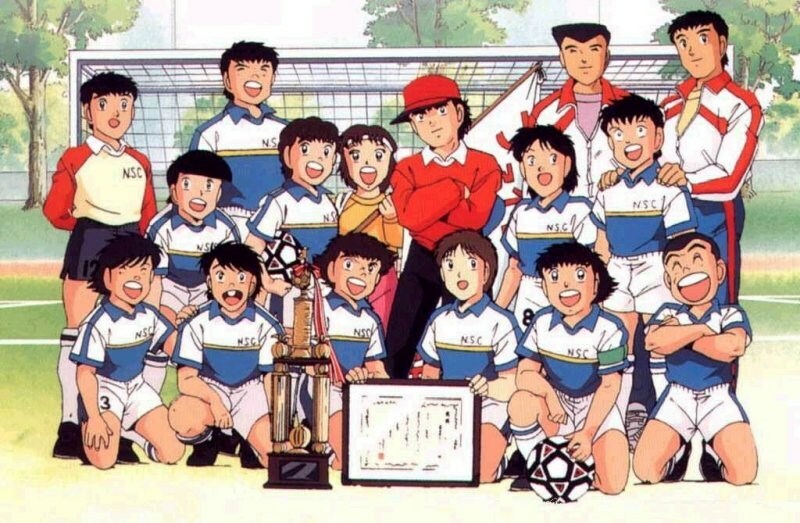 Importantly, too, there was a football based anime by the name of Captain Tsubasa that helped fuel a love for the game among children. For those who have seen the show which began it’s run in the early 80’s, they will know what I am referring to. For those that don’t, you have missed out on an inspiring anime series, which has garnered worldwide attention and been shown from South America to Europe to the Middle East and North Africa. It has inspired stars such as Hidetoshi Nakata, Alessandro Del Piero, Fernando Torres, Zinedine Zidane and Lionel Messi, amongst many others. The influence of this show on the uptake of the sport in young individuals in Japan cannot be overestimated. It both affected and reflected the growing popularity of the sport in Japan. So the plan was in place, the foundations of this grand footballing masterplan had been laid by the early 90’s and there was no going back at this point. With this, we will conclude part 1 of this piece. In part 2 I will be looking at how these changes translated into success both on the continent and internationally for the island nation. – Why March 1988? What happened on that date to justify any sort of notice, apart from a meaningless meeting of a few suits from the JSL – which was completely powerless and meaningless relative to the JFA. There are thousands of other dates to choose that are far more defensible as a “turning point” whether it be 1981 when Mr. Mori took over as NT coach and revamped the entire focus of the JFA, or 1990’s Dynasty Cup, or the most likely date of all – 11/11/93. Even May of 88, when the transition to Yokoyama Japan ushered in a generation of players who would go on to be the “stars” of the early J.League, would be a better choice. – Second, “national interest in the sport is virtually non existent.” Says who? The annual national high school tournament and Emperor’s Cup were two of the biggest sports events of the year, trailing only Koshien and the Japan Series in terms of public notice. When teams like AC Milan and Real Madrid came to Tokyo for the annual Toyota Cup, National Stadium sold out without fail. National interest in LEAGUE football was slight to nonexistent, but LEAGUE football was an amateur game dominated by corporate teams, so there was very little to recommend it to a “true football fan”. – Your use of Captain Tsubasa as a factor completely rubbishes your choice of 1988 as a pivotal date for the sport becoming more popular. After all, Captain Tsubasa was CANCELLED that year, after a seven-year run. It was revived in 1994, which would provide a good bit of support for your argument if you had chosen 11/11/93. – Last and most important of all, for future reference, anyone who writes an article about the early J.League, and references Gary Lineker, automatically loses 90% of their credibility with those who actually follow the J.League. Unless of course they mention the many people who actually made a meaningful contribution to the J.League in that era, Like Ramon Diaz, Carlos Dunga, Guido Buchwald and Careca. 1-Why not March 1988? There clearly was no single date for the game kick starting in Japan. More so you could argue the Olympic tournament appearances in the 60’s were the real catalyst of bringing it to mass attention, as I have mentioned in the article this was a multi-factorial change, not one single event changed the course of the game, it never usually works that way and Japan is no different. I chose this date simply for two main reasons, firstly impact; if I had chosen an earlier date, the impact of the velocity of the rise diminishes greatly, a later date like 1993 and Japan have an Asian Cup title under their belt. Therefore I chose that date. 2-The lack of a professional league and low attendances at league games is a symptom of lack of interest in the game. One off games between star teams would fill a stadium in India today, imagine Manchester United were to play Barcelona-that would no doubt fill a stadium in say Delhi (so might a final cup game garner a full attendance), however this does not ever correlate with “interest” in the sport being anywhere near high or far from virtually non existent for that matter-I’m using India as an example but the same may happen in another country where football is not really on the agenda. Again these are opinions, but mine is that the lack of a professional league and continental success was a reflection of the mostly apathy towards the game. 3-I refer to the fact: “the show which began it’s run in the early 80′s”. Therefore I do not shy away from accepting change began before 1988. This ties in with my reply to point 1, and goes to show the choice of 1988 was again based on personal opinion, rather than a blind acceptance that this one date changed all within Japanese football. 4-With reference to Gary Lineker, with this blog we are aiming for an English speaking audience. That is all that needs to be said in this regards, I thought about putting Dunga in, considering he was still Brazil captain when he played, but again I decided against it, the two man list was clearly not exhaustive, nor does it have to be. You should be aware that I will not be, for instance, singing the praises of Washington in part 2, who to me was an unbelievable talent & ruthless striker in the J league. Simply because this article does not aim to discuss the nuances of the league, I’m sorry if this disappoints, however I feel that may put some people off. What this website is trying to do is offer a wee insight into Asian football for people who maybe don’t know much about it, if we can do that great. If ever there is huge interest in more in depth pieces on specific players or countries, then we will try out best to fulfil these requests. Hope these answers help clarify some of the decisions made when writing this article. Thanks again for reading our piece and taking an interest. While I appreciate your effort to respond with comments that promote continued discussion and exchange of ideas, I do think that you missed the point of my post. On the subject of Gary Lineker, his name has become something of a very standard joke among people who follow the J.League. Everyone in England who knows ONE fact about the J.League knows that Lineker played for Nagoya. But you could probably count the number of Nagoya Grampus fans who know that Gary Lineker once played for their team on a single hand. Lineker wasnt QUITE as marginal a player in japan as, for example, Lubomir Moravcik (who played all of 17 minutes for JEF United before terminating his contract and going home), but he sure wasnt memorable. I suppose his fame during his career at Leicester City and Barca might make it see, a bit churlish to write him off as “meaningless”. Nevertheless, imagine how loud and long someone from England would laugh if they read an article that boasted: “Tottenham Hotspur is famous for being the club where Kazuyuki Toda once played”. Considering that your article comes so soon on the heels of Freddy Ljunberg’s ridiculous ego-fellating stint with S-Pulse (“I left because it isnt the right project for me at this stage of my career”), it should be apparent why a comment about Lineker (while leaving out so many far more illustrious players who did far more for the J.League) invites scorn. The real problem, though, is that you try to sketch a narrative that isnt really accurate, and even throw in specific details (like the “JSL revitalization committee” meeting) that nobody familiar with the J.League can take seriously. The JSL was a corporate-dominated beast that was RUINING the sport for the many fans in Japan (and there were, indeed, MANY. You dont draw 40,000 people to a high school championship game, every year, if the sport is “an afterthought for the vast majority of the population”). The visionaries were people like Mr. Mori, Mr Kawabuchi, Mr Okudera . . . . all people who were associated with the JFA, and who wanted to see the JSL eliminated – not fixed. It was these people, together with some very inspirational (then-)current and former players, who took the lead in getting rid of the JSL and replacing it with a truly independent league structure that wasnt controlled by big corporations. Sure, I understand that a person with no previous background knowledge of the game in Japan might not be aware of minor details such as this. But if you are going to write an article about the history of football in Japan, one would expect you to at least research some of the more obvious online sources, such as http://www.jfa.or.jp/eng/history/index.html (The JFA’s “official” history) or Wikipedia’s entry on the subject. One gets the strong impression that you just visited THIS PAGE: http://www.j-league.or.jp/eng/history/ (which has “political” reasons for listing the JSL revitalization committee on the first line – reasons that would take several pages of commentary to explain in full) and assumed that you had done all the research needed to write a history of Japanese football. I hope you wont take this as just mean-spirited criticism or deliberate denigration of your blog. On the contrary, Ive dedicated most of the past 10 years to trying to inform people about the beauty and excitement of the Japanese game, and as far as Im concerned, the more articles about it, the better. I just think that you could have done 100 times better, if you were willing to make the effort and take the time to actually research the topic. I think having read the contents of your comment, we have differing perceptions on the importance of various aspects to the rise of as Japanese football. There are equally some prominent contributors to the Japanese game such as Tom Byer who saw the JFA as rather slow on the uptake, and saw the importance of the business side of events. He may well be getting paid by these very same businesses, but his impact on the sport in Japan is a profound one and unquestionable. Yet again I couldn’t talk about specific people who influenced the game as I would have ended up with a thesis on the subject and like I mentioned before, my point was not to do that. That doesn’t mean I don’t see the importance of the JFA. They obviously played a huge hand in matters, applying for the World Cup that “early” on was a master stroke on their part, and their eventual acceptance that business and youth development could go hand in hand was also pivotal. But I simply could not have included all of this without running into the thousands of words. In terms of research, you can be sure I had an in depth look at all of these websites, and many more interviews besides. As I replied to your previous post, it may come across as having not researched, but I assure you it was my choice of what to include and what to leave out that maybe giving you that illusion. Refer to the Captain Tsubasa beginning it’s run in the early 80’s as an example.I researched the information thoroughly and presented my take on the importance of each factor; or not as the case maybe. Your comment regarding Linekar is self explanatory, while I generally do not approve of people belittling football leagues. I again realise many others did more for the league, many who I have followed. But the point is he was brought in to increase mass appeal and that is what worked. For many people, about one of the only things they know about the J league is that Linekar played there. Again you may find that appalling, but that is the level of attention afforded to Asian leagues here in Europe. Imagine an article which raved about Clemerson’s (Araújo) stint at Gamba Osaka. It would serve to make the league even more obscure. Really interesting read. looking forward to the conclusion! Japan has really improved a lot since the inception of J-League. The same can’t be say about my country M-League. :sad:Well done Japan. Looking forward to see the Japanese team in World Cup final 2014 in Brazil.